A wagon that wants to get off the track, village parades and circus bowling along, our latest project called le Wagon Vagabond, is multifaceted. The association des Chemins de Fer des Côtes du Nord (Northern coast railway organisation) lends us a wagon, we remove it from the track and we come to your place! The show Wagabond recounts the encounter with several protagonists who have won a round-the- world trip. Léon is born as a wagon. A son of parents that are meant to follow the tracks and the times of departure, leaving no space for his dreams, doubts and passions. A grandson of those that have been put on a sidetrack… A brother of Unpunctual who, for lack of rigour, goes round and round in circles all day long. Léon aspires to something else than a life preordained. By telling us about his family and encounters, Léon shows us we can’t do anything alone, but it is not necessary to hide because of others either! Writings by Emilie Bonnafous and drawings by Lucce*. 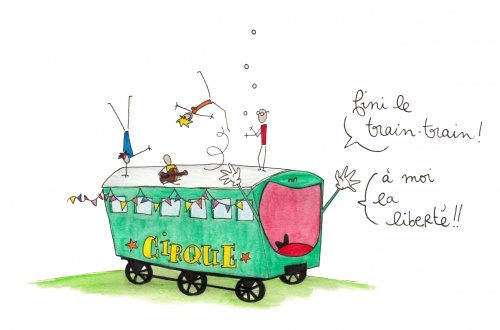 So that we can all dream, imagine and build up around the wagon, we have invented a Gare des Rêves (Dream Station), a place where anyone can participate!